Time saver: silky smooth deliciousness, topped with crisp toffee – what’s not to love? I’d had crème brûlée at restaurants a couple of times before, but it wasn’t until I made them myself that I really started to love them. My sister got me a butane gas torch for making brûlée a couple of Christmases ago, and not wanting it to go to waste I thought I’d better try it out. Ever since then I’ve been hooked. This recipe is really an amalgamation of a few different recipes I’ve come across. I’ve tweaked and adjusted as I’ve gone, and the last time I made it was the best. I’ve tried making it with fewer egg yolks – even as low as just using 3 – but it definitely works better with more, with a better texture and richer flavour. If you do use fewer egg yolks you’ll need to cook them for longer. I’ve also tried tricks like cutting open a vanilla bean and leaving it in the cream overnight before making it. It certainly didn’t hurt, but I still needed a lot of vanilla extract anyway. Generally speaking you’d make these the night before you want to eat them. If you really can’t wait, then go ahead and eat them the same day, but make sure you’ve refrigerated them after cooking for at least an hour or so. One final note: use natural vanilla extract – don’t use artificial vanilla essence, it just isn’t the same. (And since you’re going to the trouble of making this decadent dessert, you’ll want to do it justice.) You can buy it, or make your own by soaking vanilla beans in vodka. While cream is cooling, combine the sugar and egg yolks in a separate bowl, and whisk well. After a couple of minutes the mixture should go a pale yellow. Pour the (still warm-hot) cream into the egg mixture, whisking as you pour, and mix well. Distribute the mixture evenly among the four ramekins, then place the ramekins in a small roasting dish, and half-fill the dish with hot water (being careful not to splash your cream). Remove the dish from the oven, and allow to cool. Once they’re cool enough to handle, you can remove the ramekins and put them in the fridge. When you’re ready to serve, take the custards out of the fridge. Sprinkle a little sugar evenly over the tops of each one (around 1½ tsp or so), then fire up your torch. Move the flame across the surface, melting all of the sugar and caramelising it a little to get a golden brown. It takes a bit of care to make sure you don’t end up burning it, but don’t be alarmed if it’s a little darker than you were expecting. 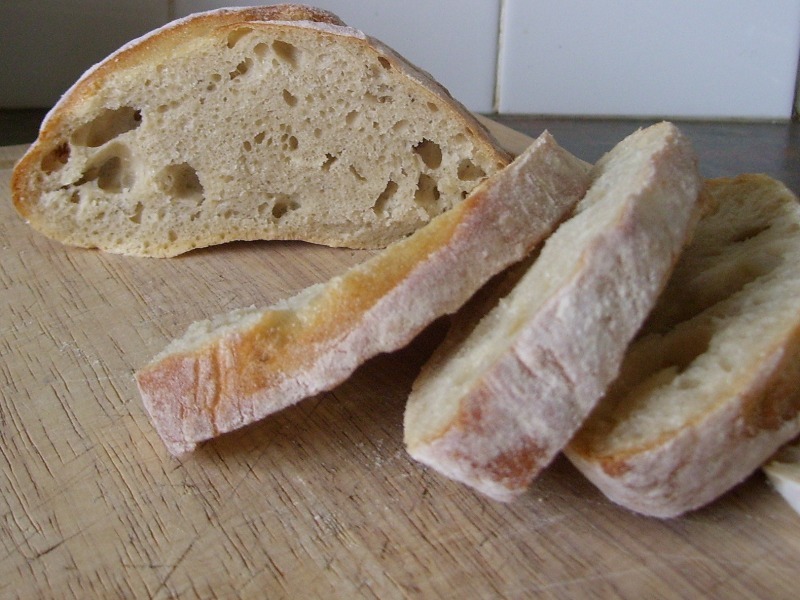 Time saver: the bread takes five minutes to make, and you want to save time?? OK, OK, Phil reveals a simple bread recipe that also doubles as a great pizza dough (and keeps for two weeks in the fridge!). When Mum last came to visit she raved enthusiastically about a new bread recipe she’d come across and encouraged me to make it. Actually, she’d started raving about it a couple of weeks (months?) before she arrived, so when she did she brought the ingredients with her and whipped up a batch in no time. And just as she’d claimed, the results were pretty impressive. The loaves it makes aren’t huge, but enough to feed two people comfortably for lunch. They’re best eaten the day they’re made, but will keep for a couple of days. Towards the end of their life they’re probably best sliced and toasted – I find a bit of avocado on some toasted artisan bread pretty irresistible. The loaves are supposed to be round, but for some reason mine always turn out oval shaped – something to do with how I’m cutting the slashes into the top. And did I mention that there’s no kneading involved? In a large bowl, put warm water and yeast and stir. Add salt and flour and mix with a large wooden spoon. 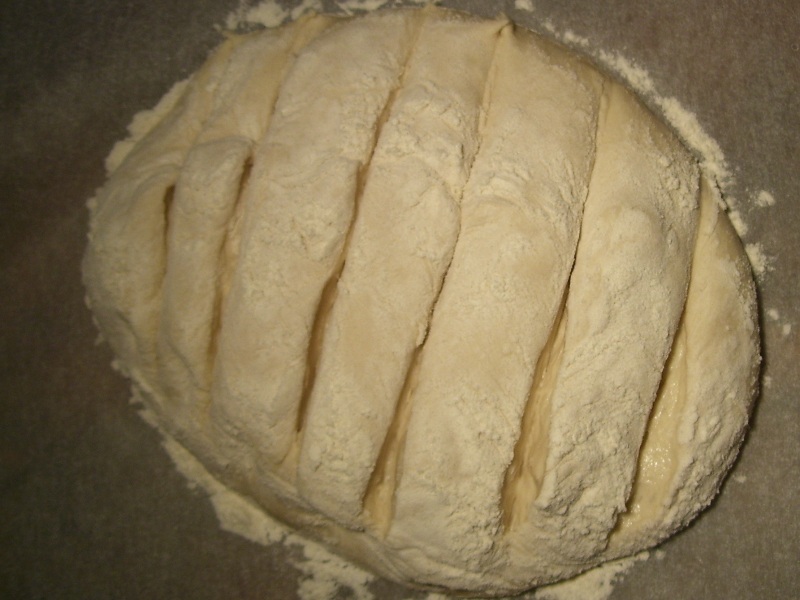 Should be a wet dough mixture, mix till combined – it should look rough and wet (for bread). Cover it with a non-airtight lid (e.g. lid or Gladwrap) until it rises up and then starts to flatten off and fall. This should take around two hours, but depends on the amount of yeast/ambient temperature etc. (It’s also fine if you forget about it and leave it overnight.) Then put it in the fridge. After 2 hours in the fridge (approx) it’s firm enough to handle. Sprinkle part of the top with a little flour. Grab a handful of the floured dough, pull it up then cut it off with scissors, for a lump of dough about the size of a large grapefruit. Have a bowl/baking sheet ready with some flour and drop the lump of dough into it, then “cloak”, forming into a rounded boule shape by stretching the top layer and tucking the dough underneath. It’s fine to use a bit of flour to do this. Put it on a sheet of baking paper and leave it uncovered for 40-90 mins. Flour the top, then cut six or so slashes across the top of it with a sharp knife – about 1-2cm deep. Place bread on a pre-heated tray (if you have a pizza stone, use it) in the middle of a hot oven (e.g. around 250°C with fan bake), with an empty oven tray beneath it (on a lower rack). As you put the bread in, add 1 cup of water to the empty oven tray. (This will cause steam resulting in a glossier finish.) Bake for around 25-30 minutes – you can check after 17 mins or so to see if the bread is cooking evenly, and turn it if not. 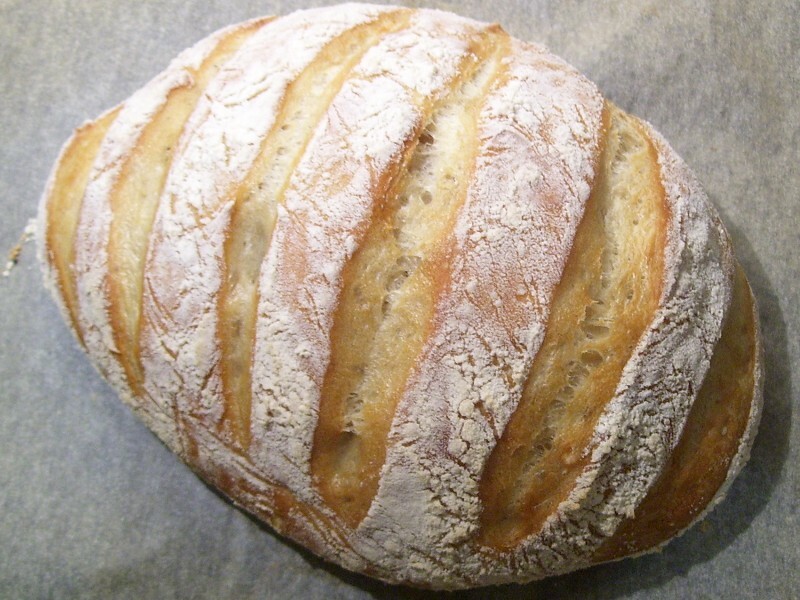 The longer you cook it, the thicker and crispier the crust – you get a really good crust after baking for 30 minutes and after you take it out of the oven the bread will make a faint crackling sound as it cools. 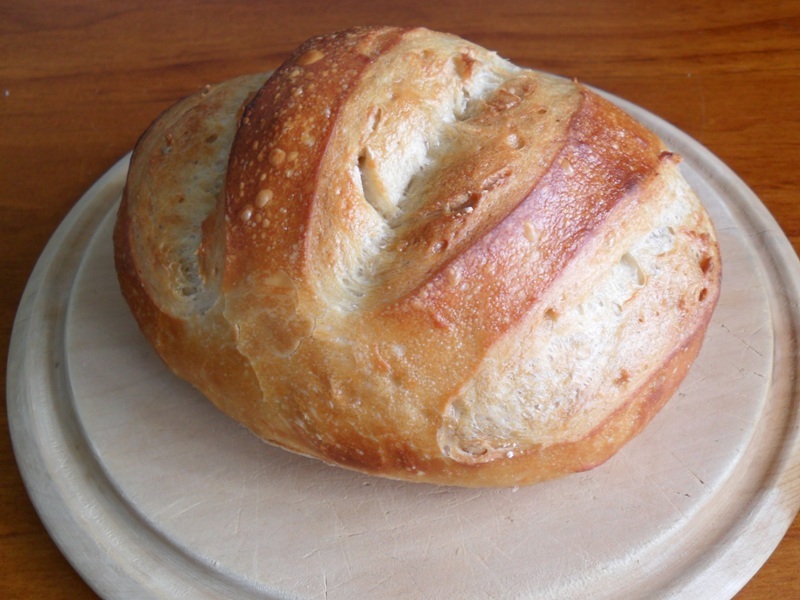 Smaller roll-sized loaves will still take about 20-25 minutes to bake. Do everything exactly the same as for the artisan bread up to (and including) step 5. 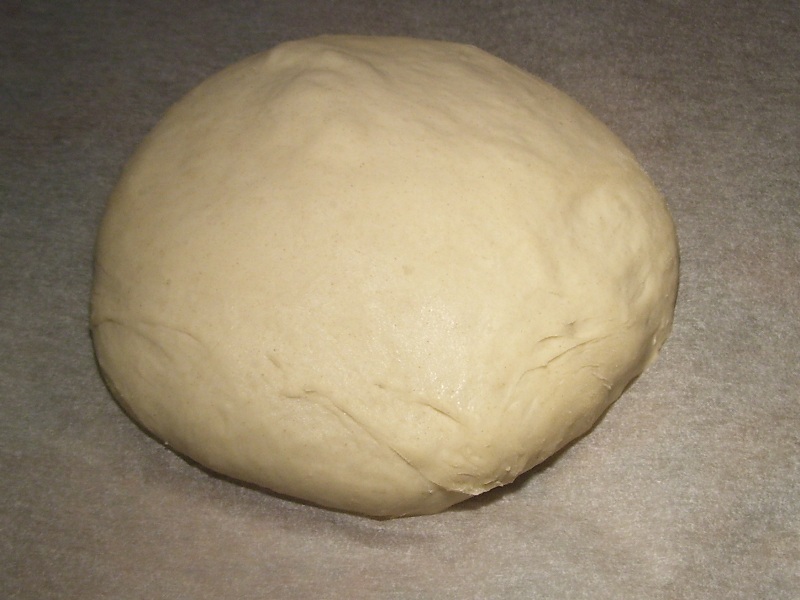 Then, after forming the dough into a round lump, just spread it out into a pizza base. (If you leave it on the bench for 30-60 minutes to warm up it will be much easier to roll out.) You can use a rolling pin, or just use your hands and stretch it like a real Italian. You’ll probably need to apply a bit of flour as you go to stop it from sticking. Once you’ve got the base spread out, smother it in your favourite toppings. Then bake in a hot oven (230°C) for around 14 minutes. You don’t need to wait for it to rise, just use it straight away. For a thin crust, use a bit less dough and stretch it thin. For a thicker crust do the opposite. Forget that bit about allowing to cool before eating too. Time saver: Phil saves you a trip to Manhattan (well, Sal’s at least). If you haven’t had Sal’s authentic New York pizza, and you live in Auckland, you should go and have some. It’s $5 for the first slice, and $4 thereafter, and unless you’re some kind of insane eating machine that means it’ll cost you $9 to feel satisfyingly bloated and full. Once you’ve done that, you can cut out the middle-man, and make this instead (but at least you’ll know what you’re aiming for). A couple of years ago I probably would have turned my nose down at this pizza – thinking it’s not-very-complicated topping lacked interest. Now that I’ve tasted it, I’ve seen the light. Unlike my last pizza, I’m going to go ahead and say that home-made pizza dough is a must. Bought bases save time, but since there’s really not much to this pizza you have to make sure everything is premium, and I’ve never seen a pre-made base that would do it justice. Likewise, with my last pizza I was happy to use cheddar cheese, with this one I’m saying mozarella all the way. Pre-heat oven to 230°C (about 450°F). If you’ve got a pizza stone, use it, otherwise just put one of your trays in to heat. 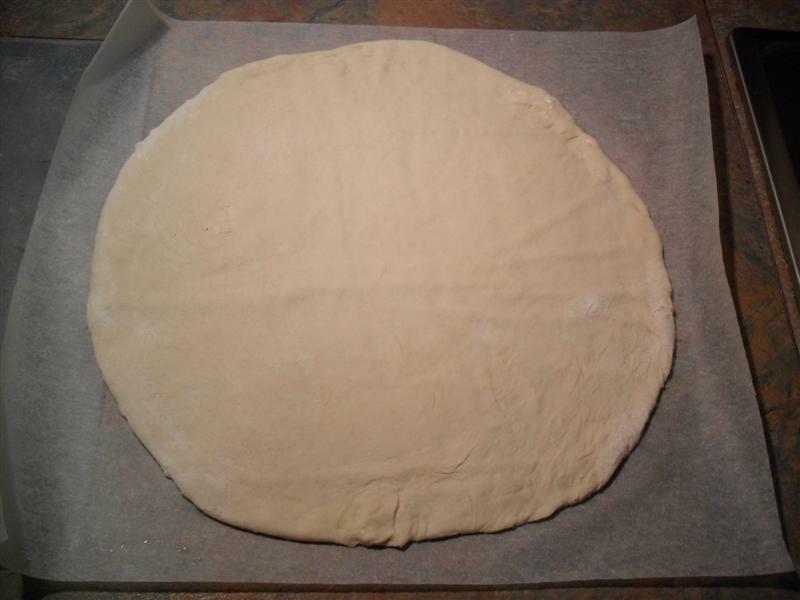 Roll out/manhandle pizza base to a 12″ circle, then place on a sheet of baking paper. The base should be thin in the centre, and slightly raised around the edges. In a small bowl, combine the tomato paste, olive oil and garlic, mix well. Spread tomato paste over pizza base, going right to the edges. Crack some black pepper and salt over the base, then sprinkle with cheese. Leave a centimetre or two clear around the edges. 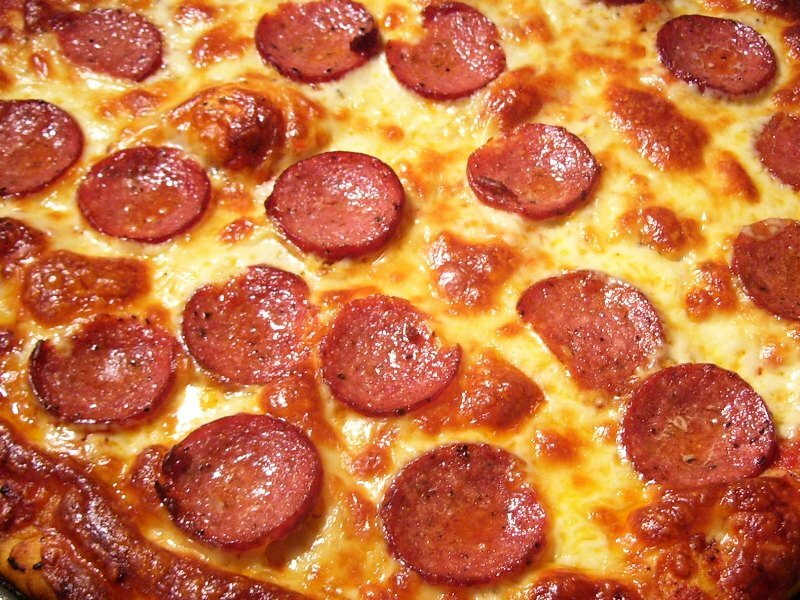 For a real New York pizza, use about 150g of grated mozarella to get that mottled, not-quite-cheese-covered look. 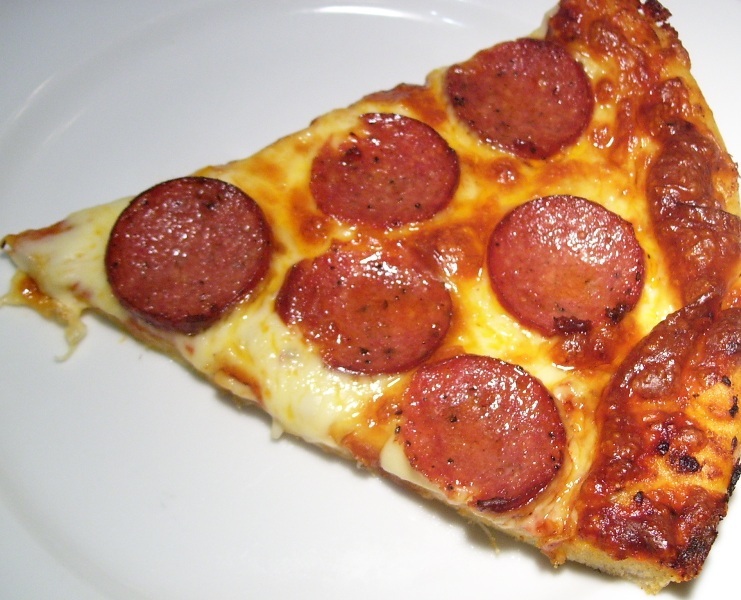 Spread pepperoni slices over the cheese – they’ll shrink a bit when cooked. Put the pizza in the oven (with baking paper) on your pre-heated tray/pizza stone. Cook for 14 minutes or so, until the base is cooked and the cheese is melted and golden. Time saver: Phil riffs on an old favourite with pastry. Cat is impressed. So last night I was making Spicy Pumpkin Soup and got hungry. You’d think that was the point of the soup, but for whatever reason I decided to make these as the soup simmered away. Tuna melts are simple and tasty. Bread, tuna, cheese, a bit of pepper and a sandwich press are all it takes for a winning combination. But what if you don’t have bread? (Regular readers might wonder why I didn’t just whip up some artisan bread, but remember I’m using the stockpot I make the bread in to make soup, pay attention people.) Branching out I had no choice but to reap the health benefits of flaky puff pastry. Long term studies have repeatedly shown that flaky puff pastry is delicious and I guess the less said about the rest of it the better. For the parcels I wanted to do a bit more than just tuna and cheese, so I whipped up a cheese sauce, threw in some blue cheese and then added the tuna to that. If blue cheese doesn’t appeal, stick with cheddar. If you want to make it a bit healthier, add some brocolli or spinach to the sauce. Pre-heat oven to about 200ºC. Melt butter in a small saucepan over a medium heat. Add flour to make a white roux. Stir well to combine and keep from catching on the bottom. Cook for around 1-2 minutes. Gradually add the milk and stir well with each addition to avoid lumps. Stir with a wooden spoon or whisk. After adding all the milk you should have a reasonably thick white sauce. Season with black pepper, then add the cheese, stirring thoroughly until it’s all melted. Add the tuna chunks (and any vegetables – strictly optional) to the sauce, and stir to combine. 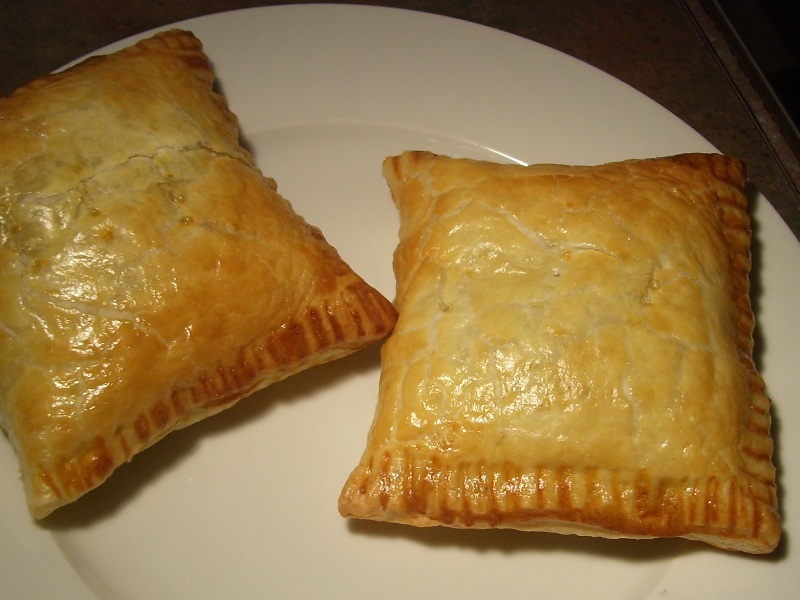 Cut each of the pastry sheets in half (giving you four long rectangles of pastry). Decide which end will hold the filling, then stab through several times with a fork. 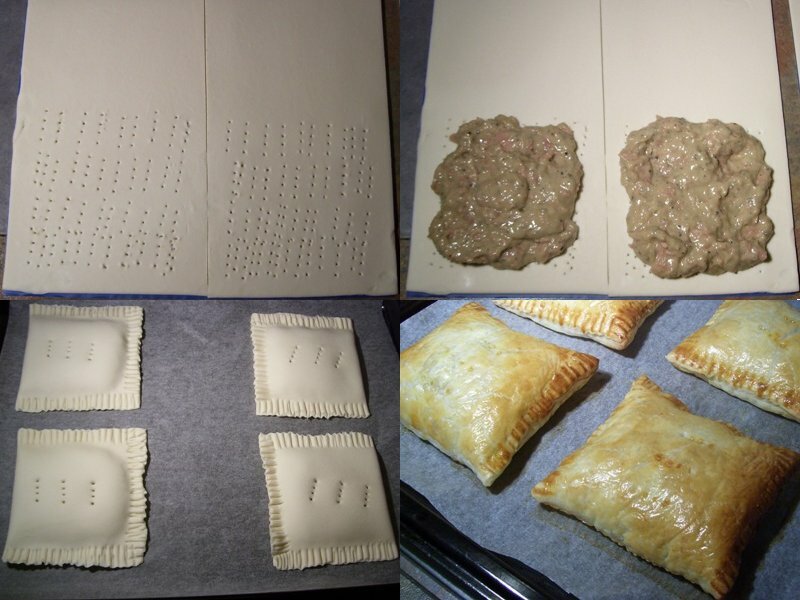 (This is to stop big pockets of air forming, causing the pastry to rise and push out the filling.) Don’t be afraid to get mean with it, but avoid putting any holes within about 1 cm from the edges. Put 4 Tbsp of the tuna filling in the centre of each of your fork-stabbed bases. Use a little water to wet the edges, the fold the (unstabbed) top half over and press down. Seal by pressing down on the sides with a fork. Make a couple of holes in the top of each parcel with a fork. Transfer the four parcels to a baking tray (lined with baking paper if you want to make it easier to get them off/clean up). If using an egg-wash, lightly beat an egg with 1 Tbsp of water then brush on to any visible pastry. (You won’t use even close to all of the egg wash. Maybe feed it to the cat, or make a miniature omelette.) If using milk brush that on instead. Bake in oven for around 15-20 minutes until the pastry is golden-brown. Time saver: Phil gets cold, busts out the soup. It’s been a few days between posts, but never fear – I haven’t stopped cooking. In fact I have a bit of a back log of recipes to write up, so hopefully my ambition is matched by motivation. We’ve had some pretty bad weather over the last few days, and winter seems to have really set in. When it gets cold there’s nothing quite like a bowl of hot soup, so bust out the stock pot and let’s get cracking. Just a quick note about the pumpkin. I’m really sorry, but I’ve never weighed it. If you think a large pumpkin is one that wins prizes at country fairs then you’ll probably want to go with half a small pumpkin. Also, if you’ve got the time and the inclination, you’ll get a richer flavoured soup if you roast the pumpkin first. If you’re short on time or just can’t be bothered, then don’t worry about it. Note that if you do roast it, the actual time to prepare the soup will be less. 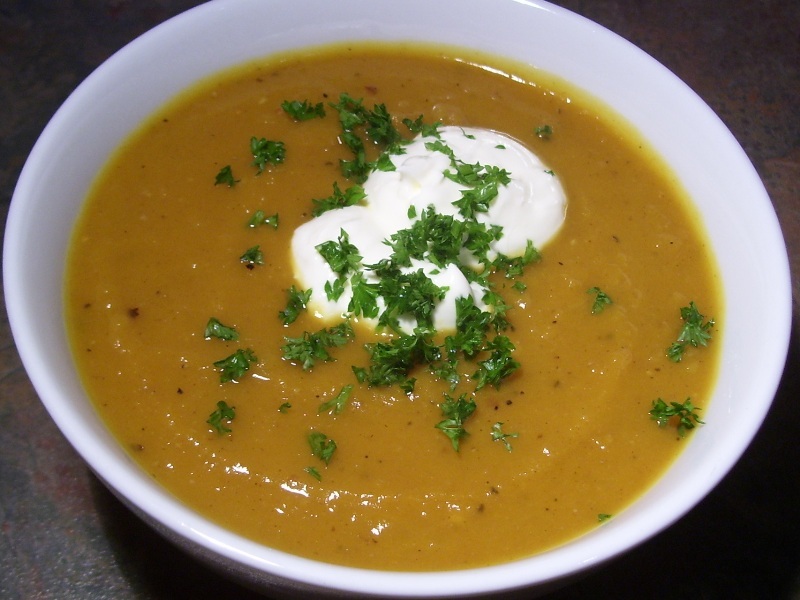 So you could roast the pumpkin the night before, and then make a fresh hot soup pretty quickly the next day. If that’s your thing. If roasting the pumpkin, heat oven to about 220°C-230°C. Put pumpkin chunks in a roasting dish, pour in a couple of Tbsp of oil (I used peanut oil for a bit of flavour, but olive oil or whatever you have handy is fine) and mix the pumpkin around to get it evenly coated. You can season it if you like, but you’ll need to adjust the soup seasoning accordingly. Roast for 15 minutes, then give the pumpkin a bit of a stir around, reduce heat to 200°C and roast for another 15 minutes. Heat oil/butter in large stockpot over a medium-high heat. Add onion, celery and garlic to pot and cook till clear (around 3-5 minutes). Add pumpkin, stock, cumin and spice and stir thoroughly. Blend soup till smooth, either by blending it in batches or (carefully) with a stick mix/hand held blender. If the soup is very thick you can add more stock or just add water. Season with ground black pepper and salt, to taste. Serve with toasted/warm bread. 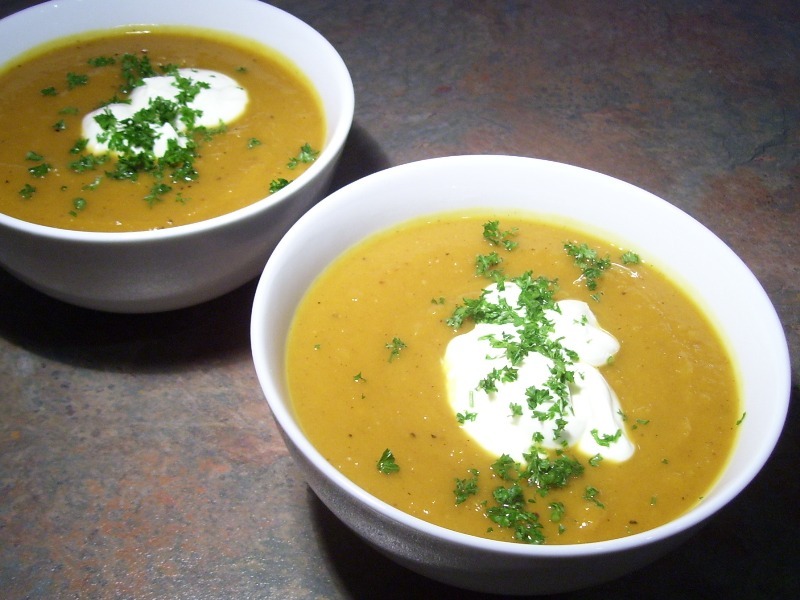 Add a generous dollop of sour cream/plain yoghurt to each bowl, and garnish with a sprinkling of fresh chopped parsley.